Here we give a brief introduction to Forex trading, in terms of the opportunity it offers, the unique challenge it presents and then, look at getting started in trading currencies from home. Lets look first at the opportunity first and the potential, to make money trading global currency markets. Why trade currencies? Of course the obvious answer is to make profits but you can pick any business or investment to make money from - so why do many people consider the Forex markets the best financial market to trade? Let's take a look. Unlike other businesses, you don't need much starting capital, just a few hundred dollars to start, a computer and an internet connection and your ready to start making profits from your trading signals. The business itself of buying and selling currencies for profit is simple to learn, you don't need a degree or to be a computer nerd, anyone of average intelligence, has the potential to be a successful currency trader from home. 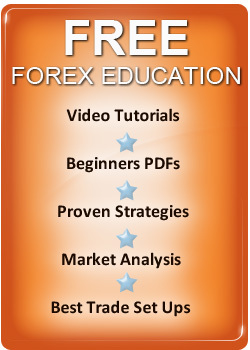 with the best currency trading strategies being simple makes trading Forex very easy to learn. You can master the basics of trading, in just a few weeks and develop a trading strategy for profits. Unlike many other businesses or investments, there is never a recession where you can't make money, there is also the potential to make profits. This is because as one currency is getting stronger another currency in the pair is getting weaker, this means there are profits available in times of both boom in the global economy as well as in times of recession. Trading also takes very little time per day and you don't have to put in many hours to make profits. The time spent on currency trading, has no reflection on the profits you can make. In our view, you can trade for big profits in around an hour a day and then, go about your daily business So in conclusion, trading foreign exchange can be operated as a part time business by anyone. If you want more info on developing a Forex Trading Plan which can lead you to success, you will find more details on other areas of the site. One of the major advantages is liquidity. The Forex markets turn over a trading volume far greater than any other investment medium and this means that you can get in out of currency pairs quickly, to cut losses or maximize profits. Commissions or spreads, on major currency pairs tend to be very small so the cost of doing business is low compared to other investments. This means the cost of doing business is less and increases the profits on your trading account. We have already noted that you can make ;profits in in rising and falling markets which means, you can always trade for profits and this is not so, in many traditional investments such as property. Currency markets also tend to be volatile and prices tend move strongly each day and this combined with the ability to leverage your account, can create profit opportunities everyday. While the facility to trade your money on margin, increases the profit potential it does of course creates risk too. You can also diversify your investment across uncorrelated currency pairs so if you see no trading signals in one pair you can scan others for profit opportunities and at any time, there will be pairs which you can trade with your trading strategy. Finally one of the main advantages for currency speculators is - currency markets tend to offer good trends which last for a long time either up or down and this means, there ideal for trading with systems based upon technical analysis. Traders don't need to know the fundamentals driving prices, they can just look at Forex charts and lock into and hold trends for profit when they do. Because trends can last a long time, this means using a chart based trading strategy can offer you huge potential for profits. You don't care why prices are moving and in which direction, you just want to make profits from trends when they do. Any trader can learn to spot, high odds chart patterns for profit and this has seen a huge number of speculators, enter the market and try and make money from trading currencies. While learning the basics of currency trading is easy, it does present a unique challenge to traders which is why so many traders end of losing their trading accounts. Currency trading for profit presents a unique challenge which is actually a contradiction and the paradox of currency trading is while its easy to learn to trade - its not easy to make money if you look at the statistics, with well over 90% of traders losing in the markets - so why does this contradiction exist? While currency trading is straight forward to learn and anyone can put together a strategy which makes money, society conditioning and the beliefs which most people hold, prevent them from making profits in the Forex markets and you will find plenty of information on this site related to both the best FX trading methods as well as, getting the right mindset to help you enter the elite 5% of winners. If you are a beginner in terms of trading Forex, the currency markets do offer huge potential for profits but you need to approach trading with the right attitude or you will lose. Here are 10 points to consider, before you start to think about learning to trade and opening a trading account. 1 Are you prepared to learn to trade currencies and get an education? 2 Are you a humble person who is prepared to accept that for long periods you will lose? If you think your clever and that you will win all the time in Forex - don't trade! You need to be humble and take losses and keep them small and keep in mind. You will probably be losing as many trading signals as you win so be prepared for this. If you are arrogant and don't like losing or looking stupid at times, then don't open a trading account. 3 Do you have the discipline to follow a set Plan? Can you follow a plan and not deviate from it? If you can't, you will probably fail at forex. If you have for example tried to follow a diet on several occasions and failed, chances are you will not follow a Forex trading strategy - so think carefully, before opening a trading account because to win, you must follow your trading plan with discipline. 4 Are you Prepared to Act alone and feel uncomfortable when you trade? If you think trading is fun you won't win, its tough mentally because you have to make trades which go against the majority and you need to feel uncomfortable when you trade but if you don't mind, trading on your own and being an individual, you can make money trading Forex. If you want to know why its hard to follow a trading plan against the majority then you can read more about Forex trading the Importance of Trading Discipline in Forex on this site. If you are prepared to accept, the above character traits are essential in terms of achieving success, you are can consider trading the world's most exciting investment medium - trading global currencies for profit. If you are interested in trading currencies from home, you will find all the information you need on this site to learn currency trading quickly and with the best methods for success. You will also find information, on how to adopt the mindset the professional traders do and win. In terms of time spent on your trading, you can spend around 30 minutes, to an hour a day trading and that's it which makes FX trading, a great way of making money for people even with full time jobs. Currency trading is a challenge but its a challenge, you can accept and build wealth with - the question is are you up for the challenge? If you are, trading success can be yours and we hope, you enjoyed our brief introduction to Forex trading for beginners.